Today I am stuck in the “anger eddies”. That’s the place where you feel angry and frustrated and annoyed for no particular reason at all. I’m being pushed and bumped and swirled around and around. I need to fight my way out before I start pushing back. Now I could take a brisk walk around the block but the streets are crowded and that would probably just make it worse. I could try to meditate but since my office is a bit like Grand Central Terminal I don’t think I could reach a Zen state. I’m not that evolved. I could breath deeply, stretch, yodel, play Yatzee – I don’t know. Any number of things to release the bad energy. But none of that stuff hits the mark right now. So instead, I will fall back on my Grandmother’s technique and feed the inner child. 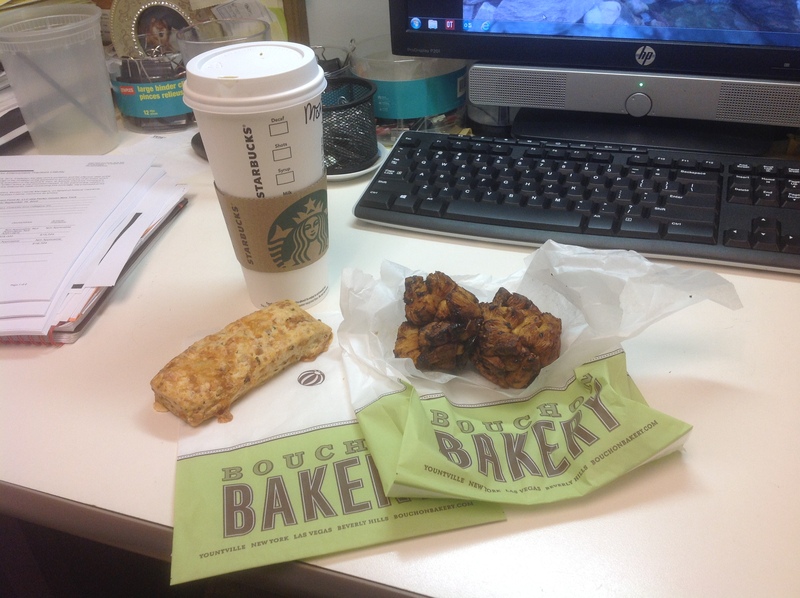 A Starbucks vente Pumpkin Spice Latte, a cheddar bacon scone and some monkey bread (for a snack later). Comfort food therapy. Works for me. This entry was posted in Daily Life, Family and tagged Food, Starbucks. Bookmark the permalink.